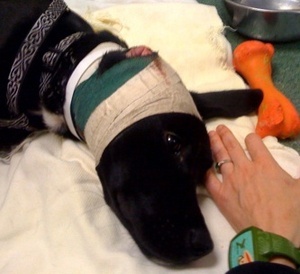 Maggie, the black Lab pup who came in with a bandaged ear, was adopted in late 2009. Maggie found a loving home. 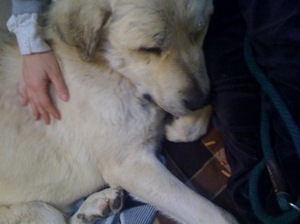 Oso, the Great Pyrenees who fooled me into thinking he was heartbroken (in truth, he was coming out of anesthesia) was adopted the first day he became available. 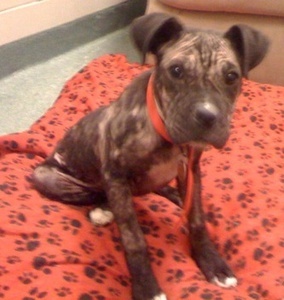 The little black Pit Bull puppy suffering from Demodex, went to a rescue facility in Arizona. 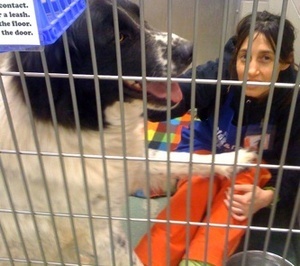 Magoo, the huge Landseer who was so terrified his first day in the shelter, has actually adjusted beautifully. He’s a volunteer favorite (especially this volunteer!) and enjoys daily romps outside and food puzzles as he waits for the courts to decide his permanent home. A perfectly placed paw, encouraging me to stay put. 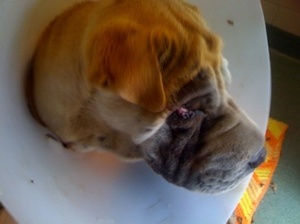 Piggy Sue, the Shar Pei, who underwent entropion surgery, is currently available for adoption at the Santa Fe Humane Society Animal Shelter. Piggy Sue, now coneless and awaiting adoption.